CHARLESTON, WV – Gov. Jim Justice announced Tuesday that November’s revenue collections were $18.8 million above estimate pushing the Fiscal Year 2019 collections to $141 million above estimates and 13.2 percent ahead of prior year receipts. It is the eighth consecutive month where collections surpassed estimates. The sharp rise in collections was attributable to very high rates of growth in Severance Tax, Consumer Sales Tax and Personal Income Tax collections. Year-to-date General Fund Severance Tax collections were 45.8% ($51.5 million) ahead of last year. Year-to-date General Fund Consumer Sales Tax collections were 13.6% ($65.5 million) ahead of last year. Year-to-date Personal Income Tax collections were 11.6% ($82.5 million) ahead of last year. November Personal Income Tax collections of $135.6 million were $7.3 million above estimate and 11.0% above prior year receipts.Cumulative collections were $44.6 million above estimate and 11.6% ahead of prior year receipts. The increase in monthly net revenue from the prior year was due to higher than expected withholding tax receipts. Income withholding tax payments of $136.1 million were 14.8% above prior year receipts. Cumulative withholding tax collections of $693.0 million were 11.7% above prior year receipts. Withholding tax collections previously grew by 9.1% during the final three months of FY2018. Data from the Work Force WV October employment report show private sector employment growth of 0.8% over the prior year with more than 22% of the job growth concentrated in the construction sector. November Consumer Sales and Use Tax collections of nearly $121.2 million were $5.8 million above estimate and 10.8% above prior year receipts. Cumulative collections were $31.2 million above estimate and 13.6% ahead of prior year receipts. 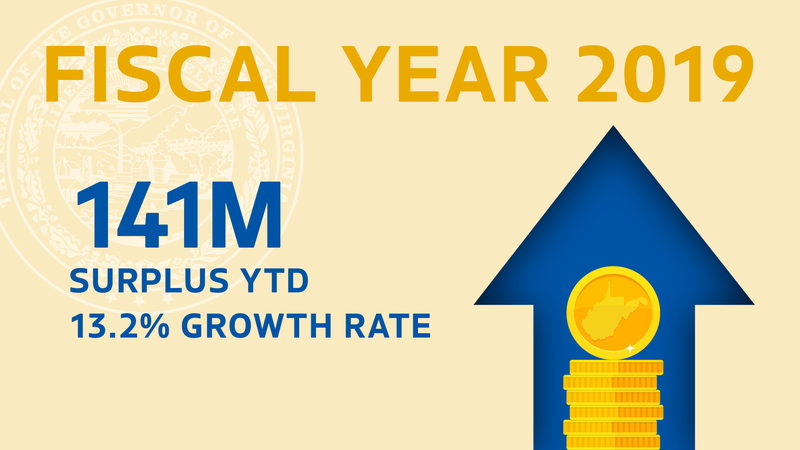 Overall collection growth, including transfers to special revenue funds, was a robust 11.0% for the year-to-date. After rising at a more modest clip of roughly 2% during most of last year, total sales tax collections rose at much higher rates of 7.8% in June, 13.3% in July, 12.9% in August, 10.1% in September, 9.4% in October and 10.7% in November respectively. 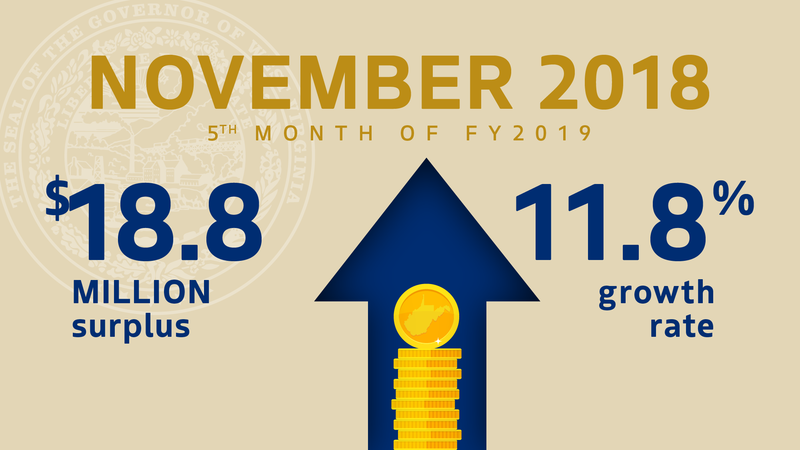 November General Revenue Fund Severance Tax collections of $42.4 million were $7.8 million above estimate and 34.2% ahead of prior year receipts. Year-to-date General Revenue Fund severance tax collections were $48.2 million above estimate and 45.8% ahead of prior year collections. Total cumulative severance tax collections for all funds were up by 37.4%. Recent strong growth in collections was partially attributable to growth in the value of foreign exports of coal. In addition, natural gas prices are trending a higher than last year with greater price stability this year. Tobacco Products collections totaled more than $15.0 million in November, an amount that was $0.2 million below estimate and 0.2% below prior year receipts. Cumulative collections were $0.1 million above estimate and 0.4% below prior year receipts. November Business and Occupation Tax collections of more than $6.9 million were roughly $1.9 million below estimate. Cumulative collections of $45.5 million were nearly $0.9 million above estimate and 5.0% ahead of prior year receipts. Insurance Premium Tax collections of $0.1 million were slightly above estimate in November. Year-to-date collections of $60.9 million were $3.1 million above estimate and 3.8% ahead of last year due to higher insurance premiums in a growing economy. In November, total State Road Fund collections of $82.0 were $37.9 million below estimate and 38.5% below prior year receipts. The shortfall was due to a $40.2 million shortfall in federal reimbursements. All other collections were collectively $2.3 million above the monthly estimate and 21.2% below prior year receipts. Due to one-time receipts from a special district road project reimbursement, prior year collections included $24.4 million in Miscellaneous revenues in comparison with less than $1.8 million for the current year. Monthly Motor Fuel Excise Tax collections fell short of estimate by $2.2 million due to a larger than expected revenue carryover to the first day of December. Monthly License and Registration Fee collections were $4.1 million above estimate and 39.3% above prior year receipts. Monthly Motor Vehicle Sales Tax collections of $17.9 million were $0.9 million above estimate and 8.0% ahead of prior year receipts. Cumulative State Road Fund collections of $534.1 million were $95.2 million below estimate and 5.5% below prior year receipts. Federal reimbursements were $117.4 million below estimate due to a time lag associated with a recently implemented upgrade in technology. Discounting federal reimbursements, total collections of $384.5 million were nearly $22.3 million above estimate and 0.6% ahead of prior year receipts. Cumulative Motor Fuel Excise Tax collections were $4.0 million above estimate and 8.6% ahead of last year. Cumulative License and Registration Fees were $10.4 million ahead of estimate and 14.5% ahead of last year. Cumulative Motor Vehicle Sales Tax collections were $9.3 million above estimate and 12.6% ahead of prior year receipts.